I'm up unusually late for me tonight. My husband is sick so I'm staying in the guest room/my office. The Mom CANNOT be sick - it's a law! So here I am - alone with my computer, and a story. In summer, I thought I was just about the luckiest kid alive. We spent all our summer weekends at the lake. It's not a big lake, but it provided us kids with about as much fun as any kid could wish for. When I was three years old, I remember my parents taking us on a LONG ride (20 minutes) into the country to look at KenRay Lake in Pinhook, Indiana. I remember wading across the spillway, walking on the dam, and skipping rocks at the waters edge. We bought a lot and my father started making plans. He and my granddad (Pat) would design and build the house. They made a little model of our future cabin out of tiny balsa wood strips. I was fascinated by it. For the next 2 years, Pat was out there nearly every day working, and dad was there most weekends. 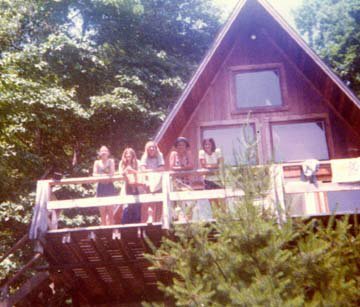 The summer I was five, we opened our cabin for the first time. That house would become the soul of a family. It was an A-frame house that sat just up the hill from the waters edge. It's front was a wall of windows facing the lake, and there was a big porch extending out. Inside there was one really big room that was the living and dining areas, a small kitchen, two bedrooms, and an upper level loft. We spent so many nights up in that loft. There were mattresses on the floor and we'd jump and tumble on them until the adults were threatening us, or we just passed out from exhaustion. We spent our ENTIRE days in the water. We couldn't wait for the first swim of the season. The winter's ice would hardly be gone before we'd be begging to swim. My parents would usually allow it -and it was COLD! We'd swim until we were blue - and get out satisfied.